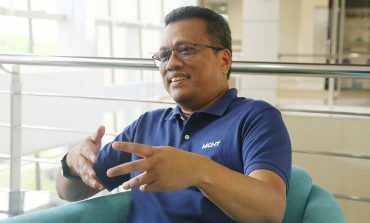 This article seeks to further a public discussion on the outlook of Malaysia’s Energy Storage System (ESS), in particular, the electrochemical technology or better known as battery. 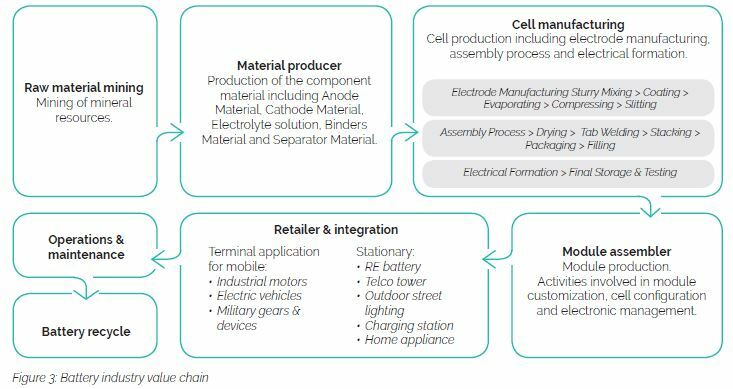 In the last couple of years, an increased emphasis on the localization of battery manufacturing has paved the way for the industry’s value acceleration. The effort was aimed at capturing a growing demand in the energy and transportation sectors. Thus, the proliferation of studies and analyses conducted in recent years on the cost structures, battery value chain and industry trends emerging provide vital inputs at the intersection of future ESS industry development. The first law of thermodynamics indicates that the energy can be converted from one form to another form and it cannot be created nor destroyed. Therefore, energy can exist in various forms including mechanical, thermal, electrical, fluid, chemical, solar, nuclear, sound and it is available to be stored in many methods by using specific technology of Energy Storage System (ESS) as shown in Figure 1. According to the Joint Working Group on Chemical Energy Research of German, Energy Storage System (ESS) is defined as a device or system that is able to take up a certain amount of energy in a controlled manner via the charging process, and contain this energy over period of time relevant to the specific context (storage) and distribute the energy over a period of time in a controlled manner via the discharging process. 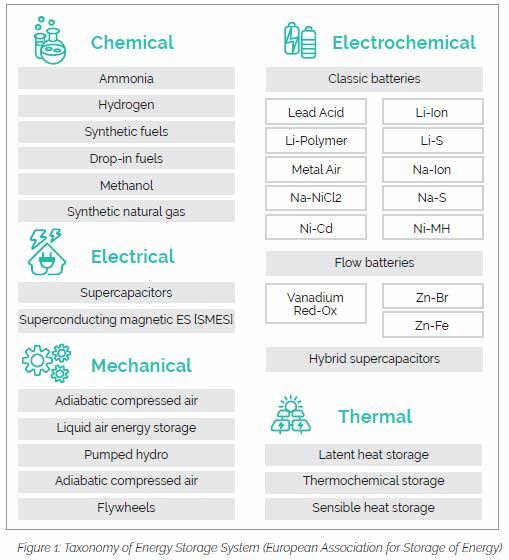 In general, there are five ESS technology categories namely chemical, electrical, thermal, electrochemical and mechanical as shown in Figure 1. As highlighted in the red box, electrochemical ESS or battery consists of two sub types; classic batteries and flow batteries. Technically, a battery consists of 3 main elements: positive electrode, negative electrode & electrolyte i.e. the chemical solution. 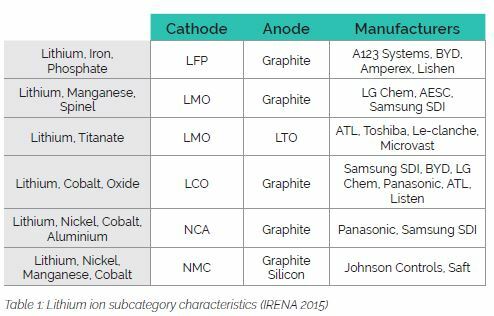 Materials used for negative and positive electrodes are different and it largely depends on product development as presented in Table 1 for the Lithium type. During the operation, the electron moves from the negative electrode to the positive electrode via the electrochemical process and thus produces the electrical energy in a process known as discharging. As the power decreases, once the battery is connected to the charger, the electron will be forced to move back from the positive electrode to the negative electrode in a process known as charging. Eventually, through repeated charging and discharging, battery materials deteriorate as the battery units deplete. 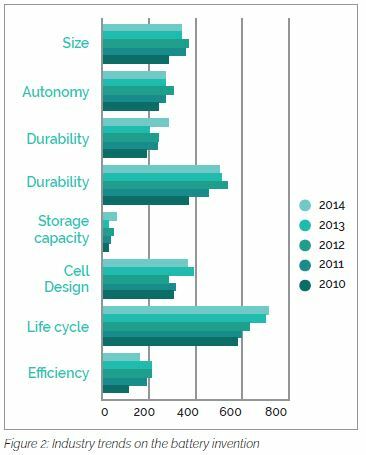 The trend taking hold in the battery industry shows an increasing effort to address battery lifecycle and improve battery discharge time as shown in Figure 2. The results are reflective of most industry players’ interests that centre around innovation activities in improving battery life cycle, discharge time and size. There are less takers however in the areas of storage capacity and efficiency. Nowadays, there are many options available that come in various material types, packaging and sizes including cylinder, button cell, prismatic, polymer sheet depending on the intended application. Based on the Organisation for Economic Co-operation and Development (OECD), manufacturing of ESS is classified as a medium high-technology industry under the Electrical Machinery and Apparatus category . Here, Figure 3 shows the industry’s local value chain and Figure 4 shows its global key players. 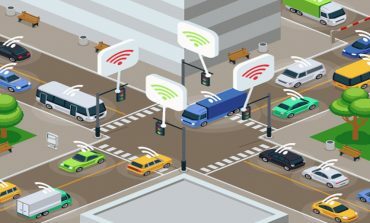 ESS is a key growth motor for the mobility sector. At present, batteries are widely utilized across residential, industrial, commercial and transportation applications. For example, in residential and commercial applications, batteries are used in electronic devices such as laptops, smart phones and tablets. Meanwhile, in an industrial setting, batteries are used to power instrument controllers, radio communication devices and etc. Further, in the transportation sector, batteries are used to provide a source of energy to power electric vehicles (EVs) such as buses, scooters and cars. 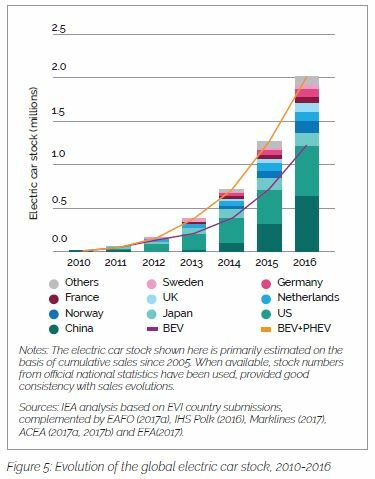 Figure 5 zooms in on leading countries’ statistical evolution in relation to EVs whereas figure 6 shows the increasing global demand for EV batteries that’s illustrated by an upward trajectory through to 2035. In addition, figure 7 shows a preliminary analysis of domestic EVs’ value proposition. 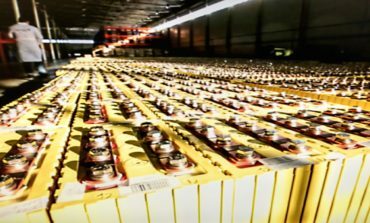 For the Malaysian battery market, all product owners, local manufacturers, importers and retailers involved in battery re-packaging activities need to comply with Malaysia’s Battery Safety Regulation underlined by the Ministry of Domestic Trade and Consumer Affairs (KPDNHEP) and SIRIM. Product tests outlined by the agencies touch various areas in relation to durability. These areas cover examinations such as over charging, over discharging, crushing, nail penetration and external short circuit via a set of rigorous testing. 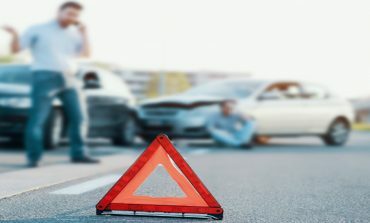 In addition, transportation standard safety testing (UN/DOT38.3) includes altitude simulation, thermal test, external short circuit test, impact test and force discharge tests. 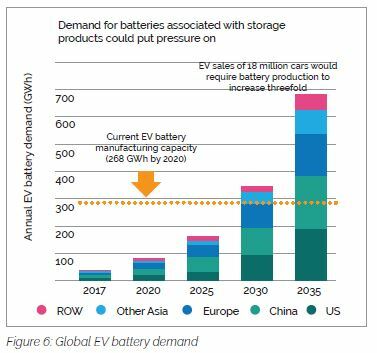 In the future, new battery technologies will offer significantly better performance in terms of physical size, capacity, quicker charging time, safety and costs. Moving forward, batteries need to be decomposed in the correct way. Batteries consist hazardous materials that can pose negative impact and risks toward the environment. The country can therefore provide more opportunities for the battery industry by increasing effort to promote local manufacturing of batteries. 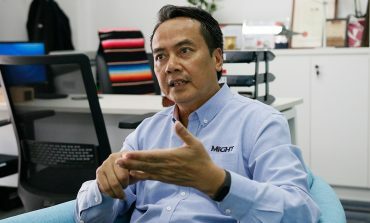 However, the agenda boils down to a few key challenges, for example, economy of scale to attract the industry’s key players to manufacture in Malaysia. On the other hand, as a battery manufacturer, Malaysia needs to factor in the added responsibility of managing waste from battery usage and end-of-life properly. Forward integration along with a fitting policy are what the industry needs to address the usage of locally made batteries. 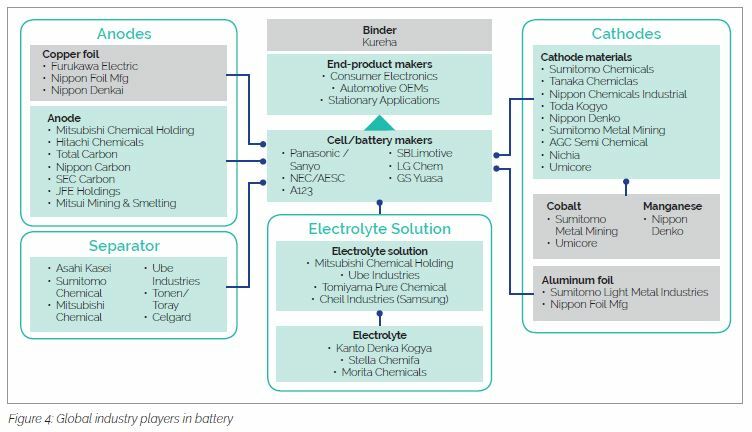 In many cases, Malaysia can enhance its capability by promoting local resources and know-how in battery-manufacturing processes and critically, batteries’ terminal integration. In short, the race to the future of the battery industry has already begun. 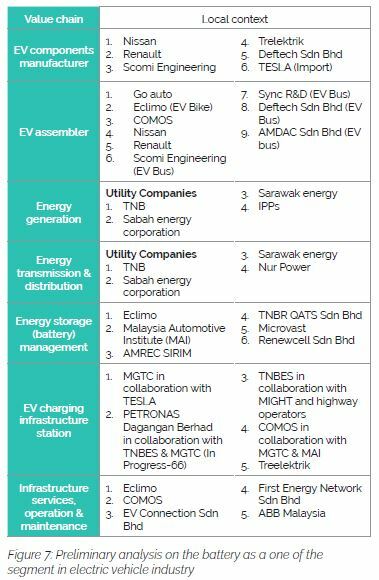 This is the overall picture of the progress and opportunities of Malaysia’s battery industry. To ease the barriers of growth, the industry requires more support from various government departments and private stakeholders to accelerate its development.